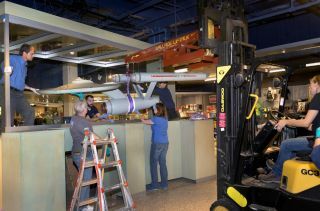 Workers restore the model of the starship Enterprise from "Star Trek" at the Smithsonian National Air and Space Museum in Washington D.C. The voyages of "Star Trek's" USS Enterprise are on hold as the Smithsonian National Air and Space Museum fixes up the 49-year-old model for a new display. The famed starship, which has lived in the museum's gift shop in Washington, D.C. continuously since 2000, is being moved to a more prominent location in 2016 – the new Boeing Milestones of Flight Hall. This move will place Captain Kirk's fictional spaceship in the same location as the Spirit of St. Louis, which carried Charles Lindbergh on the first solo trans-Atlantic flight in 1927, and the Apollo 11 command module that brought astronauts to the moon for the first landing in 1969. "I was able to make the argument within the museum if you wanted one artifact that encapsulated imagination and inspiration, the 'Star Trek' model would be that piece," Weitekamp told Space.com, pointing out that there is a worldwide fan base interested in the model's voyages. The 11-foot studio model was used on the original "Star Trek" series between 1966 and 1969. It arrived at the museum in 1974, two years before the museum moved to its current building on the National Mall. Enterprise has been "treated" three times since arriving – in 1974, 1984 and 1991. The last restoration, however, drew some concern from fans concerning the paint job. "It was too weathered and there were grid lines that were too extensive; that's the key aspect of concern," said Adam Schneider, an amateur "Star Trek" model collector who is on an advisory committee to participate in the Enterprise's restoration. He restored the full-size Galileo shuttlecraft prop now on display at Space Center Houston. While final decisions on the restoration rest with the museum, officials will do extensive consultation with the board's experts, who each have connections with "Star Trek." These include people such as Michael Okuda, the lead graphic designer for several "Star Trek" shows and movies, and Gary Kerr, a consultant for CBS on the remastered 2006 version of "Star Trek's" original series. One key decision will be what the model should look like at the end of the restoration, Schneider pointed out. When the series was running, for example, the model did not have a left side – only wires. So it will be up to the museum to figure out if they want to make it look like the pristine spaceship fans imagined on TV, or what the model actually looked like, among other discussions. "We haven't made final decisions about what exactly is going to happen," Weitekamp said. "We're trying to be careful and deliberate about what we're doing, to document what we're doing, and I think we have the benefit of standing on the shoulders of giants." Smithsonian National Air and Space Museum is restoring "Star Trek's" starship Enterprise is being restored for a 2016 exhibit opening. The projected cost of the restoration wasn't immediately available. Weitekamp said it is bundled into the overall $30 million cost of the new Milestones of Flight gallery, which was paid for through a Boeing donation. Enterprise has only been dusted since 2000, and is in need of restoration soon. The paint on the model is cracking and the nacelles – the rear engine pods – are beginning to sag and separate. How to support these nacelles without further damaging the wood is still under discussion. The model was removed from display in September and is currently inside the Emil Buehler Conservation Laboratory at the museum's Steven F. Udvar-Hazy Center, in Chantilly, Virginia. So far, the model has undergone ultraviolet photography to show consistencies or inconsistencies in the paint through different restorations. The museum also received temporary use of a portable radiography unit to take X-rays of part of the model. "It's not that we know better or are better than the predecessor [restorers] of this artifact, but museum science has really evolved and the technologies have evolved," Weitekamp said. Visitors can view Enterprise during an open house at the center Jan. 24. It is expected to go back on regular public display when the new milestones gallery opens in July 2016.